Poor women make up the majority of the recipients of projects funded by MQI. Women are the only recipients of our micro-credit projects with more than 3,000 poor women in 16 villages receiving loans. Widows are given priority for receiving these loans, in an impoverished village they are the ‘poorest of the poor’. 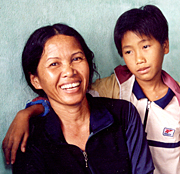 Poor women are also recipients of Compassion Houses. Read the stories of three women who are beneficiaries of these projects and who are thriving as a result: Mrs. Pham Thi Dao, Mrs. Pham Thi Huong, Mrs. Nguyen Thi Cat.